This 21 Day Fix-friendly recipe is perfect for brunch, holiday breakfasts, or feeding overnight guests. Or, if you’re like me, it’s a perfect breakfast for any day, no special occasion needed. Honestly, I’m not much of a chef…but I love a fancy breakfast, and most days that includes eggs and some roasted veggies. Most of these pictures were taken on a regular ol’ Wednesday morning, when I decided I wanted a fancy breakfast and that’s all there is to it. Be fancy, I say! After 3 minutes, remove from oven and transfer reserved yolks into the indent of each mount. 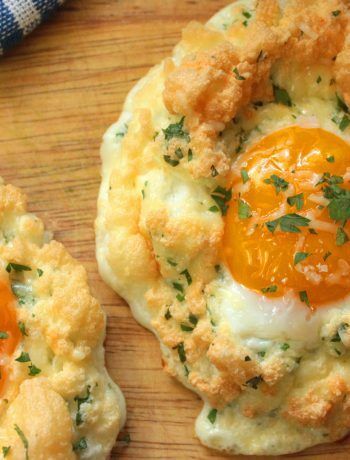 Sprinkle each mound with half of the remaining cheese and fresh chives and return to oven and bake another 3 minutes or until yolks are set and egg whites are golden brown. 0 Response to "21 Day Fix Cloud Eggs with Asago and Chives"